Another time, her husband was out of town and she woke in the middle of the night to a toy going off in her basement. After the debate of whether to ignore it or go check it out, she decided to let the battery just run out — only it didn’t, it just got louder and scarier. So then she had to hunt down a screwdriver to get the battery out, in the middle of the night. I’m not sure why toys decide to run out of batteries and go crazy and demon-style in the overnight hours, but I’ve found it to always be the case, too. It’s like they’re trying to terrify you in their last gasps of battery life. This is my personal favorite though. 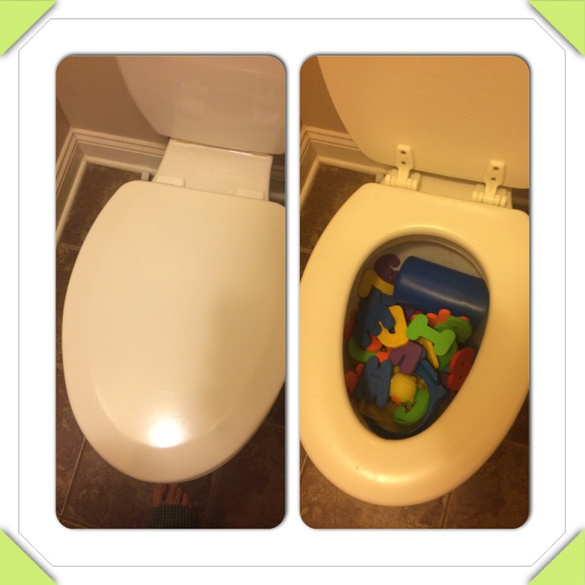 Here’s an example of her two kiddos and one of their messes. Luckily, this time it was at least a “clean mess” of bubble bath everywhere. She said her bathroom got a much-needed cleaning, and I’m sure it smelled berrylicious when all was said and done! Can’t see the video? Click here to see a bubble bath mess and a half. I asked her where she was while the mess was being made — because it’s always interesting to see just how quickly kids can get into trouble. She said she was doing laundry — for about two seconds. Like I said, when it comes to cleaning and taking care of the house, it’s two steps forward, two steps back when kids are around!